After being snubbed by the Maxwell and Doak Walker awards, San Diego State football running back Rashaad Penny was named as a finalist for the Walter Camp Player of the Year Award, the Walter Camp Foundation announced Wednesday. The award is the fourth oldest college football award in the nation. Along with Penny, Stanford’s Bryce Love, Penn State’s Saquon Barkley, Louisville’s Lamar Jackson and Baker Mayfield of Oklahoma were also named as finalists. Penny is the current leader in the FBS in rushing yards (2,027), rushing yards per game (168.9), all-purpose yards (2,698) and all-purpose yards per game (224.8). 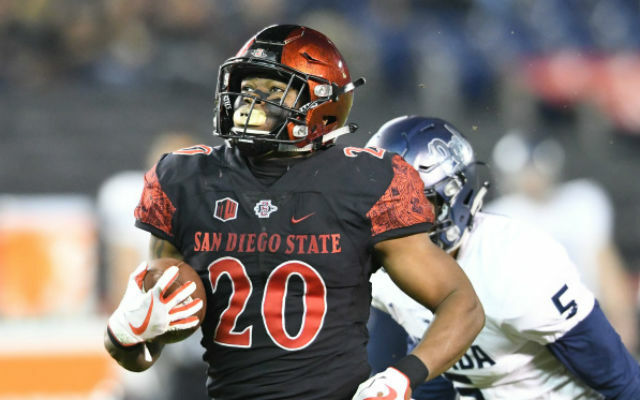 He broke the 2,000-yard rushing mark in the Aztecs’ last game of the regular season against New Mexico. The winner of the Walter Camp Award will be determined by a vote of the 130 FBS head coaches and sports information directors and will be announced Dec. 7. Also on Wednesday, Penny was named the Mountain West Offensive Player of the Year and the Mountain West Special Teams Player of the Year. He’s the first player in the history of the conference to win two Player of the Year awards in one season. He’s also the first returner in the league’s history to earn the Special Teams Player-of-the-Year award for three consecutive seasons (2015-17) and the second overall. SDSU (10-2) will find out its bowl destination Sunday.